I’ve got a secret. Or at least I used to have one, and like my mother and my aunts and my grandmothers, I carried it around in my purse until spring, right around this same time every year when bloom was the big event each day and the unfurling of tender, young grape leaves was awaited with great expectation. There is a short window when wild grape leaf vines offer up their leaves in a state that makes them perfect for stuffing and rolling into little savory, lemony fingers. If the leaves are picked too early, they’re not strong or large enough. Picked too late, and the offense is that of fibrous, veiny leaves and your inability to have discerned this makes you somewhat less of a cook, of a woman. The secret, at least in our town in Michigan (and I’d love to know if the same holds true for you), was where to find the vines in order to pilfer the leaves. Since this was always on someone else’s property, the picking was done with hushed voices and glances over the shoulder. One such place was not out in the country, but downtown, somewhere near the old Abood law offices, across a parking lot against a fence. Cousin Jim picked here not that long ago, I’m told. Close as we are, he is vague about the precise whereabouts of said vine. But it seems that the quest for fresh grape leaves has waned with the passing of the baton to my generation. There aren’t coveted spots that we hit each spring, and we’ve accepted jarred leaves as the way it goes. I’ve never understood why every Lebanese yard doesn’t offer up grape leaf vines as profusely as it does na’na (mint) or tomatoes. But like anything else, I suppose the problem here is mine: if I want it to happen, I need to make it so. 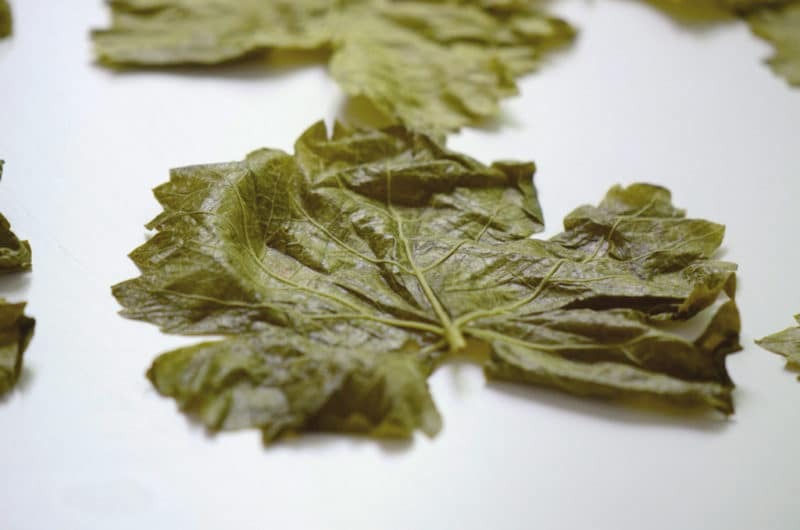 Grape leaves fit for stuffing come from wild vines that do not bear fruit. Can regular grape vines, like those cultivated for wine grapes, be used? I have two goals: one, to find out once and for all what the answer is to the wild versus cultivated question (Michigan State University is in my family’s backyard, after all, where agriculture is our pride and joy). All of the Sittis say wild-only. Much of what I’ve read says the cultivated are edible but just not suitable, because they become tougher and thicker over time (the time that makes the grapes so right for wine). If you know the answer, by all means weigh in. That way my second goal, which is to get the wild vines growing in the yards of any home in my family (and yours) that will agree to it, will be informed by whether we can start from seed or if we must transplant. I want to get the planting going because there is nothing so delicate, beautiful, and delicious as grape leave rolls made with leaves picked at the right moment in the spring by your own hand. Aunt Hilda picked them by the many hundreds and kept them in packs in her freezer to make throughout the year. It was her pride and her joy to arrive with a big pot of grape leaf rolls for any special dinner. She knew, as we all do, that commercial jarred leaves are inferior because they are so huge and can be veiny and tough. 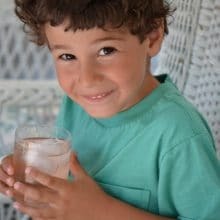 But for the rest of us who do not as of yet have a vine in the yard or a stash of leaves in the freezer, find a jar in a Middle Eastern specialty shop, or online. 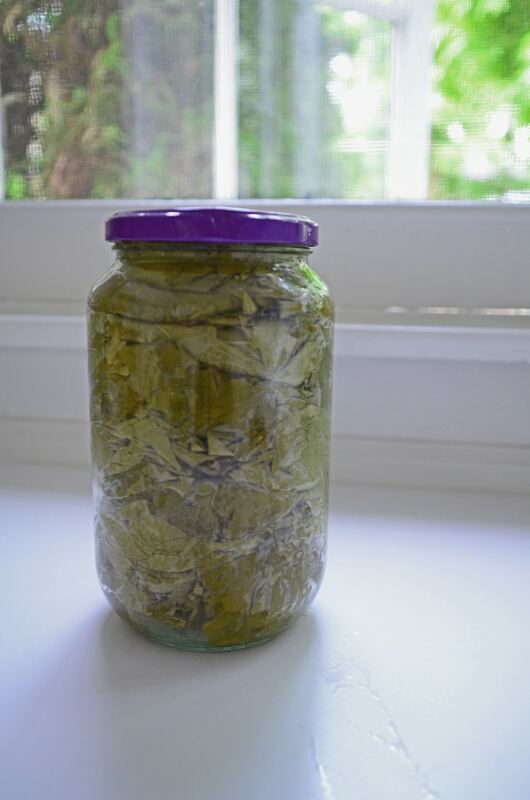 There is more to come this week about how to prepare and roll the leaves…and also about my very special jar of tender young grape leaves, with a purple lid. It came from Lebanon in my luggage, and is so precious I had to struggle with my desire to cook with the leaves and my desire to save them, for posterity. 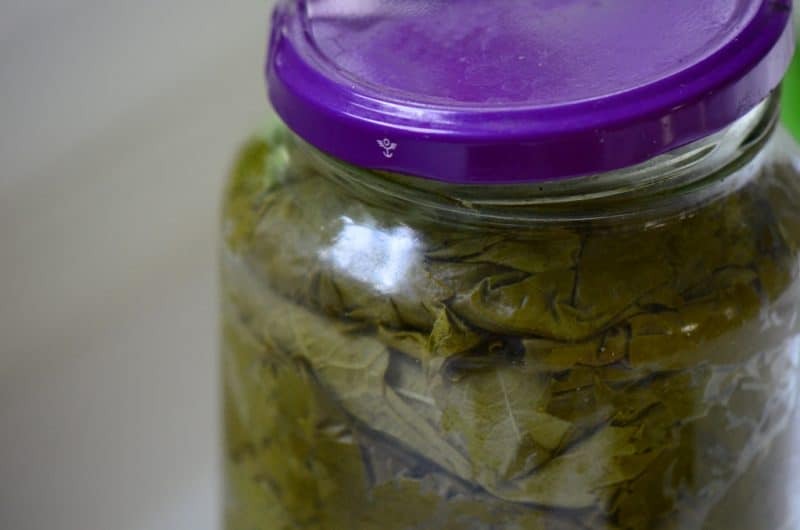 30 Responses to "Ingredient: Grape Leaves"
Maureen, I took a cooking class and the teacher said wild grape leaves are everywhere in Chicago alleys. Do you know exactly how to identify them? I’d be afraid I’m picking something else. Heidi, love all of that! Your raspberries must have tasted that much sweeter for how they were foraged! As for identifying the edible grape leaves, you are right to be cautious. I still look at some leaves that seem like they are the edibles but then they aren’t. They have three lobes and are notched all the way around, but I’d want a photo or excellent drawing handy to be sure…..
We’ve always found tame grapes to have less flavor than the wild leaves. But I’ve found since moving to Missouri that there are different varieties of wild grapes and those growing here have a different flavor than those that grow in western Nebraska. Both have a stronger flavor than the tame yet there is also a difference in the overall flavor. The canned seem to be from the tame and carry that lesser flavor combination and intensity. The wild are obviously planted by the birds and I’ve never needed to try to cultivate them but I would think that it would be far easier to dig the roots and transplant rather than go with seed. This also gives the obvious advantage of sampling the leave before digging so one knows if they will have deep notches that don’t easily hold rice and if the flavor is acceptable. I’ll bet if you picked the leaves on a farmer’s fence line a couple times then knocked on the door and asked if you could dig a couple plants he would think you were totally nuts, but not turn you down. I certainly wouldn’t and I have an 1/8 of a mile I would like to get off my fences. If you want a start of Missouri variety email me. Roger, I’m sure you are right about transplanting. I can’t believe you have 1/8th of a mile of grape leaves on your fences!!! I’m so jealous. Do you pick and freeze them, or can them? Surprised you got the jar through the TSA xrays and all without a hassle! Over the years I heard from my aunt to freeze the leaves without first washing them, supposedly that helps. Her daughter however says “I don’t want bugs in my freezer”. Others have used salt brine. I checked my plants on our clay hill and two of them are still alive but looking stunted. When first transplanting them they grew like wild. Am letting nature take its course this year without watering them, no fertilizer, I may have messed things up with too much attention. I “layered” one branch (buried a portion of the vine while leaving it attached to the mother plant) and it rooted and did OK, then the winter sort of thins them out. I know there are wild ones around but between the poison ivy and ticks you have to be careful. I don’t need another 30 day antibiotic treatment to treat Lyme disease, that was a mess! Will look around again one of these days though. I can’t tell you the number of times my Mom would suddenly slam on the brakes and pull off the road when she spotted a grapeleaf picking opportunity while driving. It always seemed to be on a windy New England road so she had to pull the car practically into the underbrush to keep is safe while she picked. Mom also taught us that the secret to differentiating from other not so edible leaves laid with the whitish color on the underside. Anybody else hear that? I have to laugh at Scot’s response….I did the same thing, only with my husband. We were newly married and on the ride home from Church one Sunday morning…I said (in a sort of loud voice) “pull over, pull over, there are some gorgeous Grape Leaves over there”. And with a quizzical look on his face…he pulled over, I got out, picked till I was happy. He now tells that story with a laugh. We are close to picking time again. I have a huge vine in my back yard Maureen…in Petoskey. It is growing up the trees though. Happy picking!! I think I have found wild grape leaves on my road. Can I post a pic for you to see what you think? Did you have any luck getting a wild vine started in your yard? If so did you have to transplant or start from a seed? That time of year is quickly approaching and I would love to get a vine started in my own yard. Do you know of anywhere that has the wild vines for sale that produces the grape leaves ideal for stuffing that so many people love. My aunt recently gave me some clippings from her vine…I was told to put in water for one week and once rooted, plant. I planted about two weeks ago so fingers crossed! Growing up we went to the banks of the river and always found wild vines there. At one point my mom pulled one out of the ground (obviously a small one, the large ones hang on for dear life! ), took it with us and for an experiment planted that vibe in a small patch of dirt in the middle of cracked blacktop behind their store. She’d heard they’d grow anywhere. And she was right! Those vines took off like crazy. All we did was water it a bit for the first month and once that vine dug itself in we had our own personal patch. I can tell you that you can pull a vine, making sure you’ve got some roots, and plant that wild vine anywhere! If you don’t want them to take over your yard and live near a river, you’ll find them. Today I live in Columbus, Ohio and there are plenty of rivers. The river near OSU has vines everywhere, and lots of parking. If your readers live here, leave a few leaves for me! Also, my mother always wiped the leaves and wrapped them in paper towels, wrapped again in aluminum foil, and lastly a freezer bag. Never wash them first. They seem to stay super fresh in the unwashed state. A bit of a wipe with a towel and you’ll remove any bugs. 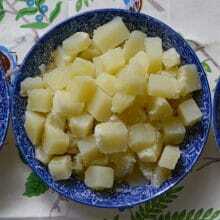 When you’re ready to use them just put them in a bowl and pour hot water on them while you’re preparing your stuffing. This was my birthday dinner in January. Mom always made sure she prepared well in advance. This is fantastic Kathleen–thank you for taking time to share all of these helpful grape leaf tips! 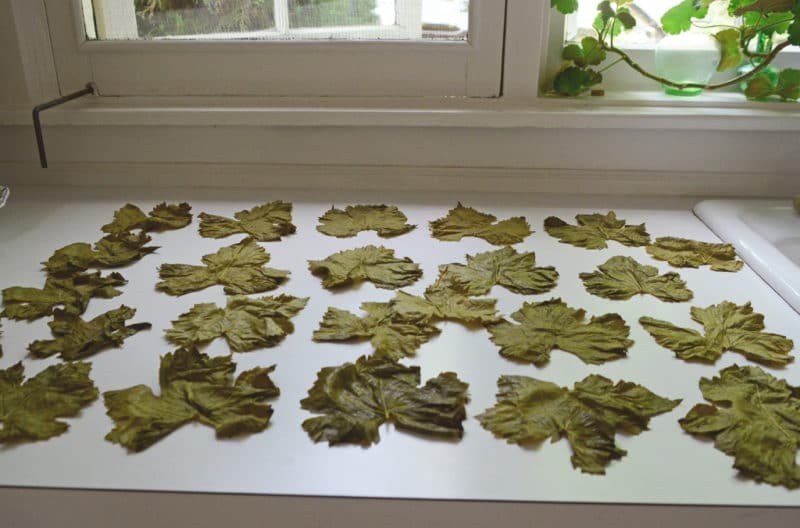 I have been picking and storing my Grape leaves in lemon juice and salt. then in the fridge. Works very well and better than frozen. I will have to try this Jennifer, thank you! I live at MSU right now, any hints as to where I can find some wild grape vines? Also, is July too late to pick grape leaves if I find them? I haven’t picked grape leaves there in a good long time Kelsey! Usually they’re best picked in June; they get a little tough by now. I have wild grapes throughout the little grove in my property. They produce a lot of fruit but next spring I may try gathering some leaves. Will taking leaves hurt the production of fruit too much? 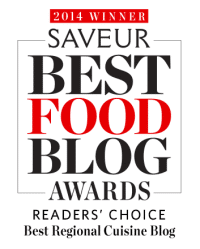 Hi Beth–the edible wild grape leaf vine we stuff don’t bear fruit. So if the variety you have there bears fruit, even if considered “wild,” is not what we’d use for stuffing for rolls! See this post on identifying grape leaves. Actually, wild grape vines do bear fruit. Some vines may only occasionally fruit, while others almost never unless given the right conditions. Birds eat the fruit and disperse the seed in their droppings. I have many, many vines on my property and most years I’m lucky to find even a couple of them with grapes. I’d say stay away from cultivated real grape leaves since they are heavily sprayed with pesticides, unless you have access to an organic vineyard. When I was growing up we had a wild grape vine all around our back fence. I have 3 sisters and a brother and we all loved to go out and pick the leaves. I always wanted to help roll them. They were so good. My mom who was full blooded Lebanese always said the wild leaves were the only ones that were good. Now I always have to use jarred leaves. I miss the wild ones. Wish I knew where to get them. Wonderful memories Marie. I’m always asking around and keeping an eye out for the wild vines, and surprisingly often they turn up in unexpected places! Absolutely! 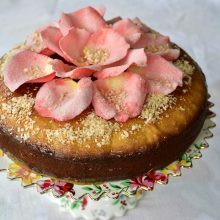 Find the recipes here and here. I live in Vancouver, Washington near Portland, Oregon. Where would I find wild grapes? I am growing Concord grapes, so if I could use those leaves I would. So hard to know! Maybe another reader from around those parts will know. But check this out to identify them yourself–once you know what they look like, you’ll spot them!